The system controls employee communication with external sources and monitors internal workflow on PCs. 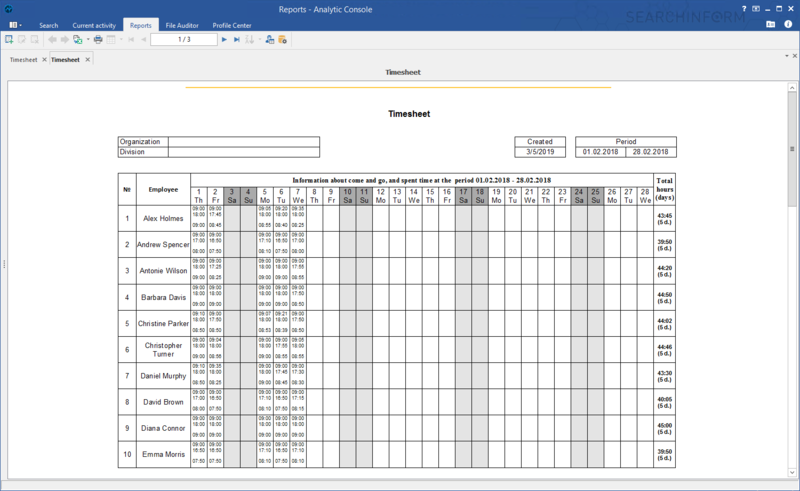 SearchInform DLP runs online and keeps track of remote employee activity if it is performed “in the field” or in a branch office using corporate devices. The system conducts a real-time analysis, identifying every ongoing event within a network. The software saves the data it obtains and allows you to restore the details, enabling retrospective investigation and providing access to the archive. Email, Skype, instant messengers, forums, cloud storages, etc. Data sent to print, uploaded to a USB, being print screened or recorded, etc. Data stored in network folders, on PCs, etc. Regardless of the business field, SearchInform helps monitor pay-offs and corruption, provides workplace morale analysis, detects risk groups, and more. Takes into account the company’s sphere of business: financial services, insurance, manufacturing, healthcare, retail, etc. The SearchInform experts develop security policies cost-free at the client’s request, which are necessary to comply with the corporate rules and local law. The system searches for images similar to a sample, searches within audio recordings making a transcription of audio into text and enables a content search within a video recording of user activity allowing to investigate video fragments of particular interest. More than 100 reports give you a structured data layout for any requested area of the controlled activity. 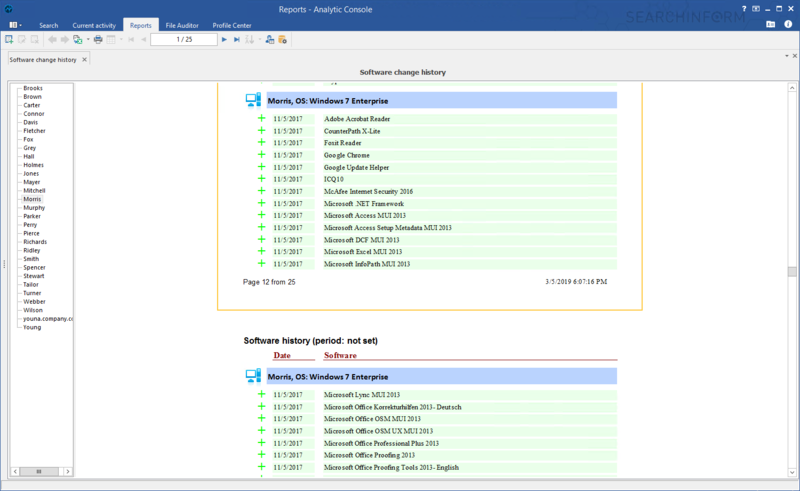 Reports visualize all the connections established via internal and external communication channels and display a sender and a recipient of information. Plug and play – install the system and run the monitoring straight away. 200+ preset policies make the investigation process preconfigured and activate the analytics capabilities as the software is unpacked. Businesses in different industries are equipped with the solutions specifically tailored to them. All the data gets archived to assist with the retrospective investigation. Discover bribery and accepting kickbacks, reveal informal leaders and track a violation down to a source, learn about the ways and reasons information gets leaked. SearchInform clients get to test the product and get a feel for its value to their businesses before they buy it. The trial features the products full set of functions and training. 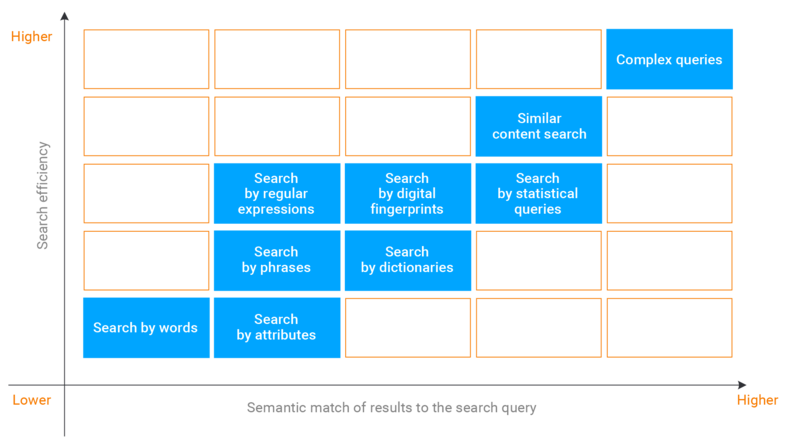 SearchInform Risk Monitor is a multi-component system. All the solutions are smoothly integrated. Clients can purchase the full software packages or select among particular modules of the product and customize their own bundle. And this can be done by the client’s staff. There is no need to disclose the internal documents and processes. Moreover, the SearchInform experts will provide round-the-clock technical support to the clients. Installation does not require any changes in the local network’s structure. Thus, the product’s deployment will not cause any downtime or call for any adjustments to your ordinary established processes. It not only operates at the local network level but also at the level of each individual computer. The software saves data even while employees are working from home or are away on business trips. SearchInform teaches its clients how to operate the software, helps develop security policies, provides consulting on the interception analysis, and keeps clients updated on new software features and capabilities. 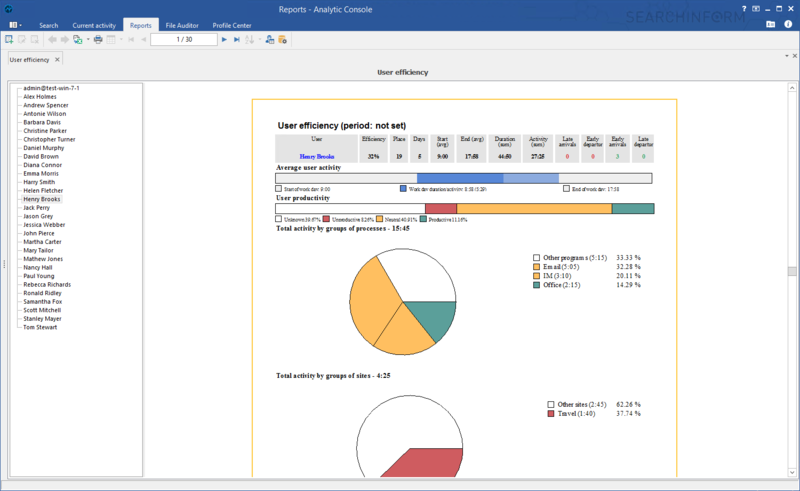 SearchInform DLP’s reports visualize all the activities taking place within a company. Having an objective and detailed idea of all processes and activities provides a means to stop violations and analyze possible threats for the purpose of preventing potential incidents.